Bicycles are a perfect tool for almost every person. They keep you fit. They can ride around traffic snarls, often with a more direct route. They can carry you, a friend, your kids, your groceries. They can take you down the block or across long distances. And they are great for actually seeing the environment you traverse. Over 10 years’ experience planning cycling routes that are scenic and safe. Routes run the gamut from urban adventures to rural scenery. Develop both paper route sheets and turn-by-turn GPS maps with any landmarks or hazards noted. Receive plaudits from local riders and bicycling advocates for creative route design. 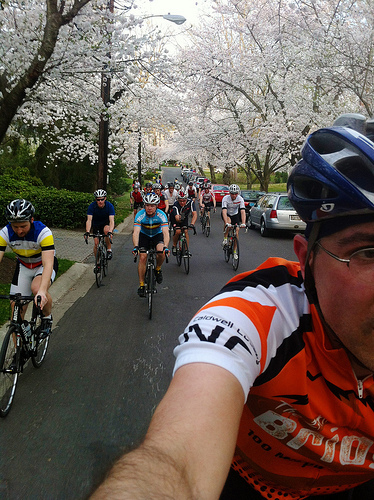 10 years’ experience leading group bicycle rides and tours for Potomac Pedalers, a 2,000+ member cycling club in the Washington DC area. 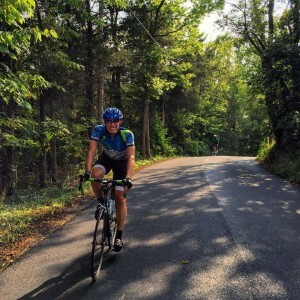 2 years’ experience leading curated group bicycle tours with The Bluemont Connection, a bicycle adventure company based in Washington DC. 2 years’ experience leading group bicycle tours for Cultural Tourism DC. Provide clear instructions to riders, making sure all are riding safe equipment and all have proper route maps. Able to adapt to changing situations while on the road, re-routing riders, assisting with breakdowns or crashes, providing on-the-road support. Receive praise from riders on tours I lead for quality of leadership, friendly approach to riders, swift resolution of any issues, and excellence in planning of routes and handling of groups both large and small. Red Cross First Aid & CPR trained. Helped plan and run Potomac Pedalers’ Back Roads Century in 2011, 2012, 2015, 2016, 2017. Worked with state and local governments and law enforcement to ensure a safe, organized event day. Worked with vendors and supporting businesses to coordinate pre-event and day-of-event services, such as mechanical support and food distribution for riders. Helped coordinate volunteers to run aid stations, registration, and SAG support. Scouted routes for 2015-2017 editions of the Back Roads Century, finding low traffic, easy-to-moderate difficulty, highly scenic roads that also had conveniently spaced areas for rest stops. Copyright © 2016-2017 R.D. Riet. All rights reserved.